Congratulations parents. You did it. You survived the summer holidays. It’s time to revel in the peace and quiet that comes with the back to school period. Once you get past the book lists, new uniforms, early morning chaos, packed lunches, school-run traffic … ok so maybe it’s not all smooth sailing from here! But to help you out, we’ve collated five back to school health tips to give your little ones the best chance at staying happy and healthy in 2017. Think colour. That’s the key to a healthy lunchbox, lots of different colours. To get their fruit and vegetable intake up try carrot or celery sticks with hummus or tzatziki dip. You can also try roast chicken and salad pita breads or savoury vegetable muffins. You could even switch the sandwich for a hearty salad once a week as a special treat. Delicious and filling salad ideas include chickpea, capsicum, tomato, red onion, parsley and lemon juice. You could also try beetroot, goat’s cheese, lentils and rocket. 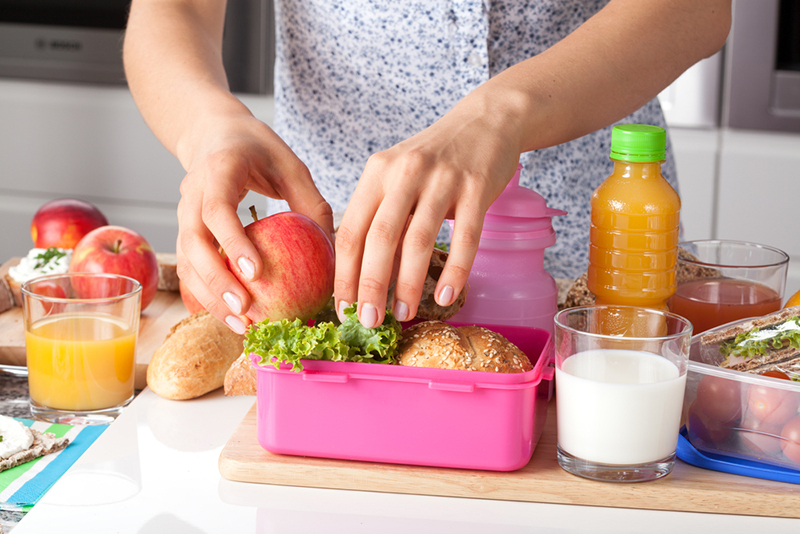 The bonus of giving your kids something delicious, and yes a little bit fancy, for their lunchbox is you can simply make an extra large batch and have what’s leftover for your own lunch. If you’re still stuck for ideas, Taste has a fantastic collection of free lunchbox recipes. Kids need to be drinking enough water to keep them well hydrated. It’s important to ensure they have access to plenty of drinking water during their school day. In Queensland, where the climate is warm, this is especially important. If your child doesn’t like drinking water, try filling one quarter of the drink bottle with water and freezing it the night before. This will keep the water nice and cold throughout the day. Your child won’t have to wait all day for it to defrost. Or you can try adding natural flavours such as sliced lemon, lime, cucumber, mint or apple to give the water just a hint of flavour. Back to school means getting back into a healthy routine and ensuring your child has a healthy sleep routine. This is one of the most important things to consider when thinking about your child’s back to school health. A lack of sleep has been proven to have negative impacts on a child’s ability to concentrate in class. It also affects their ability to absorb information. The Australian Centre for Education in Sleep says children who do not get enough sleep can also suffer from weaker immune system and increased obesity. Queensland child sleep expert Amanda Bude told the Courier Mail that many parents did not realise how much sleep their child actually needed. “On average children are not getting enough sleep and we need to remember that guidelines are not set in stone and a well-rested child can have high sleep needs or low sleep needs. Not all children are the same,” she said. So use eight hours as a guideline but don’t be concerned if some children require more or less to function. Also remember that exposure to the bright light emitted from mobile phones, tablets and television screens has also been shown to have a negative impact on sleep quality. The risk from intense light is especially significant for teenagers, who generally need more sleep (8-10 hours compared to 7-8 for most adults). Sleep physician Dr Chris Seton told the ABC that too much screen time can trap kids in a vicious circle. “Screens not only take away sleep because they take up time, but they make kids more wakeful. The more wakeful they are, the more activity they do,” he said. So set aside some tech-free time in the hour before bed. If your kids are finding it hard to adjust to the earlier post-holiday bedtimes, try reducing bedtime by just 10 minutes each day until you reach the desired routine. While many adults look back on school days as the most carefree time of their life, remember that when you’re a child, school can sometimes be daunting, especially when starting a new grade. Give them time to adjust and offer them lots of reassurance but be careful not to dismiss their concerns. Take time to speak to them about their worries and if bullying is a concern, work with them to reach a solution. Sandra Hiller from Family Lives recommends sitting down and actually listening to what your child is telling you, then show you heard what they said by ‘playing it back’ to them. She recommends asking your child how they want you to help them instead of simply taking over. This can make them feel excluded from the decision making process and might make them even more stressed and worried than they already were. Backpacks with padded shoulder straps are a much better option for children than shoulder bags, satchels, or handbags. When a backpack is worn correctly, strong muscles in the back and abdomen support the weight of the pack, which is relatively evenly distributed. But even the best backpacks can strain muscles and cause back pain if they’re too heavy. It is important to keep an eye on how many books your child is carting too and from school. This especially important with secondary school students due to their heavier workload. Encourage them to be organized so they only bring home the books they really need each night.